Nathalie Means Henderson is an Area Superintendent for the Central Learning Community for Fulton County Schools. 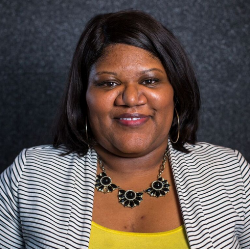 During the Fellowship, Nathalie served as Instructional Leadership Director for Oklahoma City Public Schools and as principal at Jefferson Elementary School for St. Louis Public Schools, where she improved the Annual Performance Report from 32% to 70%. This improvement earned the school full accreditation designation in a district that was provisionally accredited for the 2014-2015 year. During her time in St. Louis Public Schools, Nathalie served as a principal on special assignment, assistant principal, and special education teacher. During her tenure as a principal, Nathalie was awarded the 2012 St. Louis Metropolitan Urban League Young Professional of the Year, the 2013 St. Louis Public Schools Principal Pettus Award of Excellence, and the 2013 St. Louis American Salute to Excellence in Education Award. Nathalie holds a Ph.D. in Education from the University of Missouri-St. Louis, an Ed.S. in Educational Leadership and Policy Studies from University of Missouri-Columbia, an M.Ed. in Special Education from the University of Missouri- St. Louis, and a B.A. in History from Spelman College.